Cervical myelomeningoceles (cMMCs) and meningoceles account for 1-5% of all neural tube defects. They have been published as isolated case reports in literature and very little is known about their follow-up. There are very few articles published in the literature, dealing with follow-up of cMMC. ,,, Here, we report a case of cervical meningocele in an asymptomatic patient who was detected to have myelocystocele with tethering on imaging and was surgically treated. A 6-year-old boy presented to us with the history of swelling in the posterior cervical region. Past history revealed a "cosmetic" repair of similar swelling at the age of 3 days. On examination, he had a large midline posterior cervical swelling measuring 6 × 5 × 4 cm. The swelling was oval shaped, cystic with a wide sessile base and covered with full-thickness skin bearing scar of the previous surgery [Figure 1]. On examination, growth parameters, developmental assessment and neurological findings were normal. 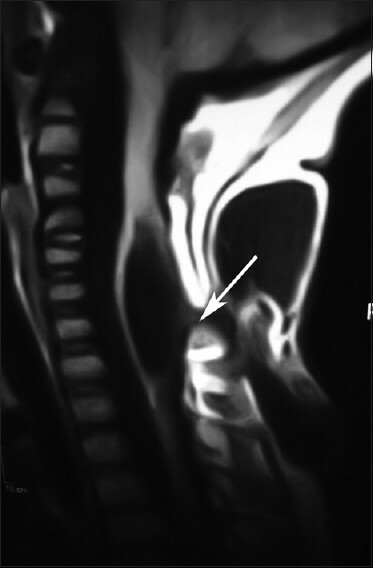 Magnetic resonance imaging (MRI) of the cervical spine revealed a fluid-filled cyst in the subcutaneous tissue of posterior neck consistent with meningocele. There was a communication seen between the meningocele and the cord through a spina bifida at sixth cervical vertebral level. The meningocele was associated with a syrinx just in front of the communication [Figure 2]. There was evidence of a second cyst within this meningocele consistent with myelocystocele [Figure 3]. There was no evidence of hydrocephalus, craniovertebral junction anomalies or dysraphism in other part of the spine. The patient was taken up for surgery. Through a linear incision, the meningocele was defined. The sac was transected and another sac was found within this, which on exploration was attached to cord. Detethering was done. The patient recovered and is doing well. Classification and nomenclature of cystic cervical lesions is a controversial topic and various authors have suggested different classifications. The earlier terms used to describe cMMCs included syringoceles  and syringomyeloceles. Maclone et al. 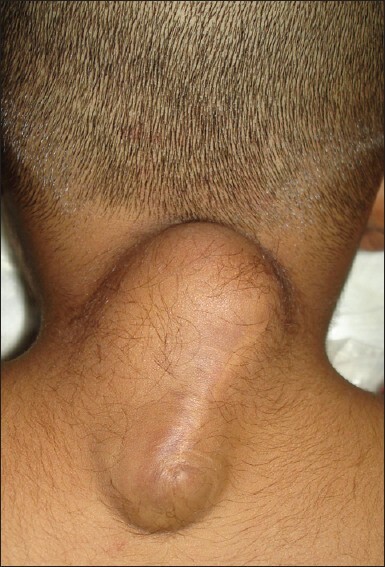 defined cMMC as closed spinal dysraphism characterized by skin-covered posterior midline mass, a narrow posterior spina bifida and cerebrospinal fluid-filled cyst. Steinbok et al. in the early 1900s proposed the hypothesis of limited dorsal myelochisis and divided cMMCs as meningoceles and myelocystoceles. Pang et al. proposed a classification system based on the internal structure of the cystic lesions, dividing them into limited dorsal myelochisis containing fibroneurovascular stalk in a dural sac and split cord malformations containing two hemicords in a dural sac. Salomao et al. divided these into 1) cystic spinal dysraphism of the cervical and upper thoracic region with a stalk of neuroglial or fibrovascular tissue, 2) myelocystoceles consisting of a second ependymal-lined cyst herniated inside a meningocele and 3) cystic spinal dysraphism of the cervical and upper thoracic region without a stalk or true meningocele. Habibi et al. and Rossi et al. classified cervical myelomeningoceles into two sub groups: fibroneurovascular stalks and myelocystoceles. [5,10] Our case report adheres to the definition given by Maclone et al. and with respect to other classifications it can be called as limited dorsal myelochisis, myelocystocele and cyst herniation within meningocele. Patients with cMMC differ from those with thoracolumbar and lumbosacral meningomyeloceles. Neurologically a patient with cMMC is well preserved when compared to those with thoracolumbar or lumbosacral myelomeningocele. The concept of tethering in cMMCs has not received much attention because of their rarity and very slight ascent of cervical cord during growth. However, several case reports have documented tethering in cMMCs which presents as neurological deterioration in the future. ,, The role of imaging in asymptomatic cervical spinal dysraphisms has been emphasized in literature. ,, Magnetic resonance imaging is the modality of choice in these lesions, which helps to distinguish the subtypes of cMMC  and to identify the associated anomalies of central nervous system like hydrocephalus, split cord malformations, tethering, syringomyelia and Chiari malformation More Detailss. Surgical exploration of these lesions should be aimed at preventing infection, achieving cosmesis and most importantly releasing the tethered cord. Simple excision of meningocele sac and transection of the communication can provide a cosmetic repair but cannot prevent neurological deterioration due to tethering. , Neurological deterioration in patients undergoing cosmetic repair without detethering has been well documented, which made re-exploration and excision of tethering structures necessary. , Thus, resection of the lesion without detethering is insufficient and surgery of these lesions should include intradural exploration and detethering, with an aim to prevent neurological deterioration in the future. 1. Meyer-Heim AD, Klein A, Boltshauser E. Cervical myelomeningocele: Follow-up of five patients. Eur J Paediatr Neurol 2003;7:407-12. 2. Salomao JF, Cavalheiro S, Matushita H, Leibinger RD, Bellas AR, Vanazzi E, et al. Cystic spinal dysraphism of the cervical and upper Thoracic region. Childs Nerv Syst 2006;22:234-42. 3. Pang D, Dias MS. Cervical myelomeningoceles. Neurosurgery 1993;33:363-73. 4. Sun JC, Steinbok P, Cochrane DD. Cervical myelocystoceles and meningoceles: Long-term follow-up. Pediatr Neurosurg 2000;33:118-22. 5. Habibi Z, Nejat F, Tajik P, Kazmi SS, Kajabafzadeh AM. 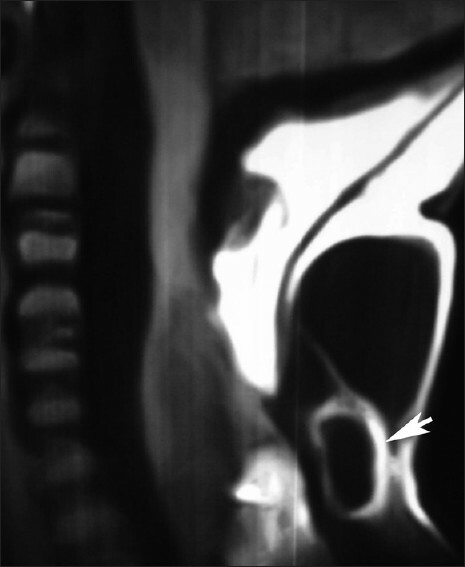 Cervical myelomeningocele. Neurosurgery 2006;58:1168-75. 6. Doran PA, Guthkelch AN. Studies in spina bifida cystica. I. General survey and reassessment of the problem. J Neurol Neurosurg Psychiatry 1961;24:331-45. 7. Barson AJ. Spina bifida: The significance of the level and extent of the defect the morphogenesis. Dev Med Child Neurol 1970;12:129-44. 8. McLone DG, Naidich TP. Terminal myelocystocele. Neurosurgery 1985;16:36-43. 9. Steinbok P, Cochrane DD. The nature of congenital posterior cervical or cervicothoracic midline cutaneous mass lesions. Report of eight cases. J Neurosurg 1991;75:206-12. 10. Tortori-Donati P, Rossi A, Cama A. Spinal Dysraphism: A review of neuroradiological features with embryological correlations and proposal for a new classification. Neuroradiology 2000;42:471-91. 11. Shore RM, Chun RW, Strother CM. Lateral cervical meningocele. Clin Pediatr (Phila) 1982;21:430-3. 12. Duz B, Arslan E, Gönül E. Cervical congenital midline meningoceles in adults. Neurosurgery 2008;63:938-45. 13. Akay KM, Gönül E, Ocal E, Timurkaynak E. The initial treatment of meningocele and myelomeningocele lesions in adulthood: Experiences with seven patients. Neurosurg Rev 2003;26:162-7. 14. Konya D, Dagcinar A, Akakin A, Gercek A, Ozgen S, Pamir M. Cervical meningocele causing symptoms in adulthood: Case report and review of the literature. J Spinal Disord Tech 2006;19:531-3. 15. Andronikou S, Wieselthaler N, Fieggen AG. Cervical spina bifida cystica: MRI differentiation of the subtypes in children. Childs Nerv Syst 2006;22:379-84. 16. Feltes CH, Fountas KN, Dimopoulos VG, Escura AI, Boev A, Kapsalaki EZ, et al. Cervical meningocele in association with spinal abnormalities. Childs Nerv Syst 2004;20:357-61.